Which Hammer for which application? Metabo's powerful hammers are always the right choice when it comes to processing hard materials such as stone or concrete. The pneumatic impact mechanism generates high-energy impacts with only minimal extra force required from the user. Metabo's powerful hammers are always the right choice when it comes to processing hard materials such as stone or concrete. 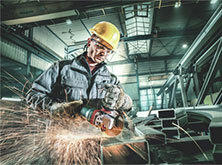 The pneumatic impact mechanism generates high-energy impacts with almost no extra force required from the user. The high performance hammer mechanism is precisely mounted in a housing made of aluminium alloy, which is resistant even to the hardest mechanical loads. The enormous power combined with user-optimised ergonomics make the Metabo hammers the ideal tools for demanding applications. From compact cordless, multi, drill and combination hammers in the SDS plus range to the extremely powerful SDS max combination hammer KHE 96 with 1,700 watt and 20 joule single impact energy (according EPTA) we have the right machine for every application. 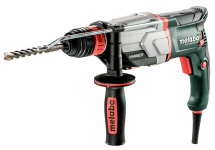 Metabo offers you maximum mobility with its cordless hammers: The KHA 36 LTV cordless combination hammer with 36 volt combines the advantages of mains-powered machines with the flexibility of a cordless tool. With its maximum single impact energy of 3.1 joule it is however a real power pack. 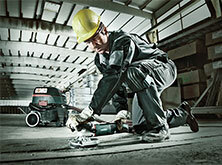 The combination hammer drills holes up to 32 mm in diameter into concrete without any problems. Thanks to the high battery pack performance and capacity and the quick drill progress, using this machine, you do not only work in a powerful, but also in a particularly efficient manner in the workshop, on the construction site or in the industry. Our particularly compact and versatile KHS 18 LTX cordless combination hammer with a high single impact energy and low weight impresses in the 18 volt class. 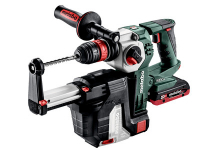 Metabo offers a comprehensive range of accessories for all professional tools: from carbide-tipped hammer drill bits with two or four cutting edges and different chisels to carbide tipped router bits and drill bits, at Metabo you find everything you need.